Portuguese Barbecue Chicken is one of the most traditional and popular dishes in Portuguese cuisine. Simple and easy to make, this dish is quite healthy and utilizes the natural and zesty flavor of lemon along with a spicy Portuguese paprika kick to make an unbelievably flavorful and hearty dish. It requires very easy to find ingredients you will likely find in your kitchen, so go ahead and try this traditional and delicious Portuguese dish out and tell us what you think. 1) In a platter, place the 2 lbs of chicken. 2) With a spoon, mix the wine, lemon rinds and juice, tomato paste, oil, paprika, hot pepper sauce, garlic, and salt to taste in a bowl. 3) Pour this marinade over the chicken in the platter. 3) Cover and let it marinate in the refrigerator for about 4 hours. 4) Place the chicken on the grill over medium heat placing the remaining marinade in a separate bowl and place it aside. 5) Close the lid and let it cook for about 10 minutes on each side or until it is well cooked and slightly blackened. 6) Take the remaining marinade in the bowl you set aside and place it in a saucepan on medium heat for about 5 minutes. 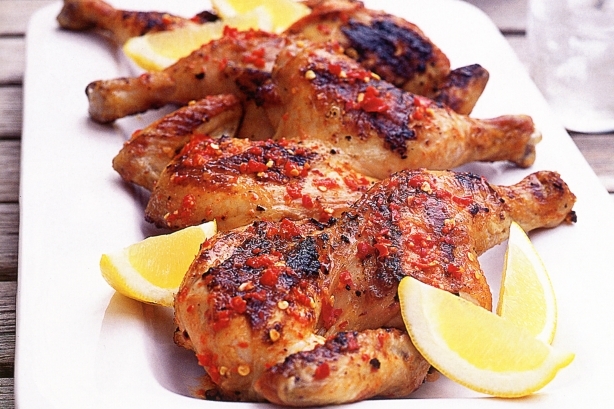 6) Once the chicken has been grilled well, place in the platter and pour the marinade over the chicken. 7) Serve with a lemon sliced into quarters for extra flavor and enjoy!